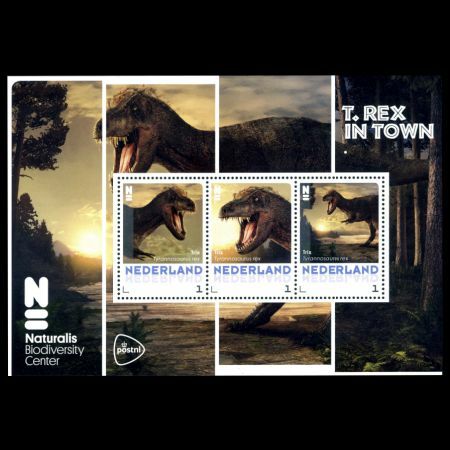 Netherlands 2016 "T.rex in town"
On September 10, 2016 Natural History Museum "Naturalis Biodeversity Cente" (Leiden, Netherlands) in cooperation with Netherland's Post, issued a Souvenir Sheet with three personalized stamps to commemorate "T. rex in town" event that took place between September 10, 2016 and June 2017. 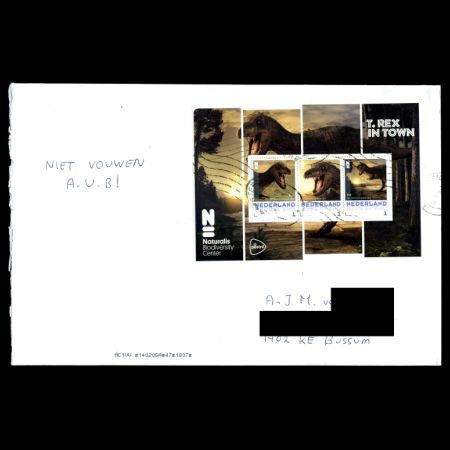 Although issued by Netherland's Post, they were only available through their collectors shops at more than twice their face value. Logo of the museum is depicted on bottom-left corner of the sheet. 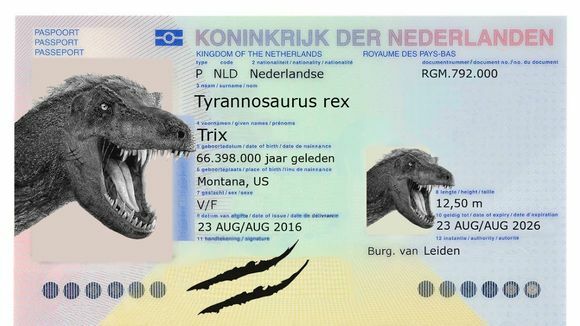 All stamps shows reconstruction of Tyrannosaurus, named "Trix" in honor of former queen Beatrix. This is the first ever full Tyrannosaurus skeleton of Netherlands and is the first and only T. rex permanently exhibit outside of North America. The story of Trix began in the summer of 2012 when the museum's director, Edwin van Huis, expressed his ambition to get Tyrannosaurus. 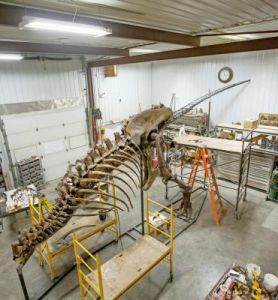 Researchers of Naturalis went on an expedition in the United States, where almost a year later fossil of Trex was unearthed out of the sandstone in Montana. With the help of crowd funding, the Naturalis Biodiversity Centre, succeeded in excavating and buying this unique prehistoric treasure at a cost of EUR 5 million. 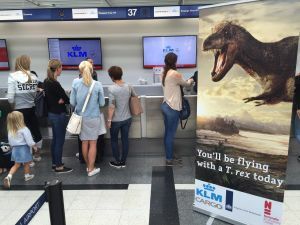 On 23 August 2016, 250 passengers on a KLM flight departing from Chicago’s O’Hare International Airport heard a surprising announcement while they were waiting to board. They were told that they’d be flying to Amsterdam with the 66+ million year old Tyrannosaurus. 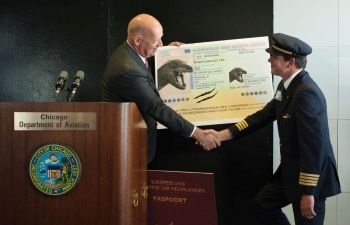 At an earlier press conference, a group of representatives from the Netherlands and the US unveiled a large Dutch passport for the dino. Trix officially arrived in Leiden a few days later and was welcomed to town with a celebration featuring hundreds of local school children. A caravan that included a marching band, a T. Rex parade float, TV naturalist Freek Vonk, and paleontologist Anne Schulp led a lorry carrying the bones to a stage set up in the city’s historic Beestenmarkt. 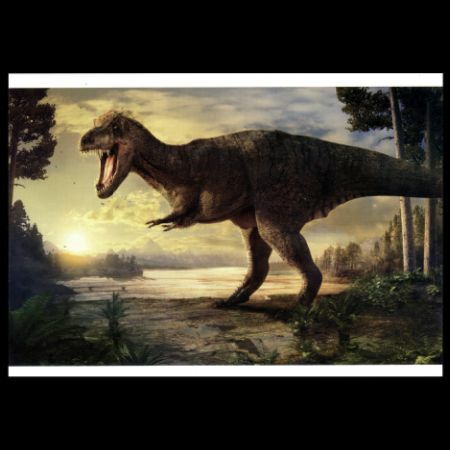 During its lifetime, the dinosaur would have stood 4 – 5 metres tall and weighed 5,000 kilogrammes. The skeleton measures 12.5 meters from nose to tail and four meters from the hip down. 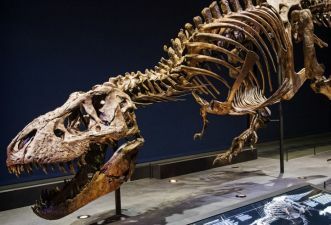 According to analysis of Naturalis staff, the dinosaur was likely a female and would have died at about the age of 30 around 66 – 67 million years ago. 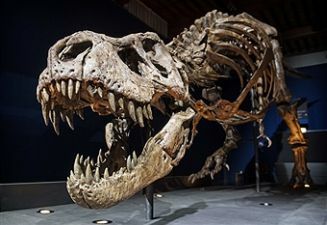 The skeleton contains about 80% of the bone volume, that consists of 300 bones, 55 of which make up the huge skull and it is one of the most complete skeletons of Tyrannosaurus found to date. Missing bones reproduced by 3D printing. The 3D printed bones are painted a slightly different color so that visitor of the museum can see what part of the skeleton was missing. Trix mounted in a unique position, low to the ground pose that will make her seem more dangerous and intense than other T.rex skeletons in museums around the world, allows to visitor to see in eyes of this dangerous prehistoric predator. The pose was choose because Trix feature her actual skull instead of a replica, which requires a substantial amount of support that can’t be achieved with a more traditional pose.